The next stop on the Card Player Poker Tour is just 10 days away, and you can join us for the poker action, fun and sun as the CPPT boards the popular cruise ship MS Oasis of the Seas to sail around the Caribbean. 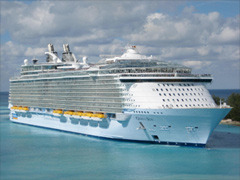 Card Player Cruises, the premier poker cruise company, will host the poker tournament April 13 – 20, 2013, during Royal Caribbean’s 7-Night Western Caribbean Cruise. Packages start at just $979 per person for the 7-night cruise. To book the cruise, click here. Deadline to book the cruise is this Thursday, April 4th. The event will feature a $1,100 main event, single table satellites, plus live games. The ship will depart Ft. Lauderdale, Florida, and will make ports of call in Labadee, Haiti; Falmouth, Jamaica; and Cozumel, Mexico. World Series of Poker champion and well-known travel blogger Barry Shulman says of the cruise ship, “The MS Oasis of the Seas, the first of its class, is more akin to a small city. The ship is in fact so large it does not fit in the Panama Canal. It has a crew of about 2,400 and 6,000 passengers. It and its sister ship are by far the nicest mass-market ships. They are family friendly and have way more to do that any other ship by a large margin.” As founder of JetSetWay.com, Barry has been on over 100 cruises, 36 ships, and 16 cruise lines. For more information visit Card Player Cruises website, or call Card Player Cruises at 1-888-999-4880 1-702-655-0919. To book the cruise, click here.